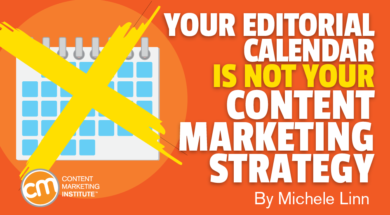 Blogger Michelle Linn’s recent post “Your Editorial Calendar is Not Your Content Marketing Strategy”, explains the importance and difference between your editorial plan and a solid strategy that is shared and understood by all team members throughout your organization. thinkCOMPASS assists organizations who want to increase their customer engagement, increase their online presence and conversion sales by developing custom, high-level content marketing strategies along with a complementary editorial plan to support it. By providing businesses with the expertise and resources needed to execute their strategic plans, thinkCOMPASS is able to successfully help businesses reach their marketing goals and initiatives. More and more, I am hearing marketers talk about how they have a strategy . . . and then proceed to say they are set because they have an editorial calendar. At the risk of sounding ranty, I’d love to yell from the rooftops: An editorial calendar is not a content marketing strategy! While this conflict may seem like an issue of semantics, the confusion and meshing of these terms point to a bigger issue. I am a big believer that you need to have both a strategy and an editorial plan or calendar. And you need to understand how each is different because the absence of one may explain why you are feeling uncertain in your efforts. Let’s say you are building a home. An architect leads the design of the structure by creating an architectural plan. But then a civil engineer makes the design possible – implementing and adjusting the plan to realize the architect’s vision. Do you need an architectural design for your new home? Absolutely. It’s the vision of what you want to achieve. You would help your architect understand your needs (your why) – your strategy. Where do you want to move? How big of a house do you need? Are you beginning your family and want room to grow, or are you looking for something more compact and easy to maintain (one of those trendy tiny houses, perhaps)? How does your home fit into your overall family budget – and how much do you want to spend? These are just some of the questions you need to answer before creating a plan. The architectural phase of your new home is akin to your content marketing strategy. With that architectural strategy, you are ready to have the civil engineer create a building plan to implement the vision. That’s akin to your editorial plan or calendar. If your editorial plan isn’t feeling quite right, chances are high that you don’t have a solid strategy – or your team doesn’t have a shared understanding of what that strategy is. You need to clearly understand the answers to these three questions – and having this clarity isn’t as common as you may think. But, when you look at what their strategy includes, just over half have a content mission, a deep understanding of their personas, and goals tied to their content. Again, if you don’t have these things in place, something is going to feel off. And, while your strategy typically comes from the leadership team, don’t make excuses if you don’t have one. Does everyone else on the team have the same understanding of the strategy? Ask them the answers to the three questions above and see how consistently everybody is communicating the strategy. Keep the answers to those three questions simple and ask your team to post them on a wall or keep them close by until they internalize them. I can’t stress this enough: If you don’t stick to your audience and mission – with a focus on your goals– you will flounder. Unlike your plan, your strategy is relatively set in stone and won’t change too often. Every single thing you publish and communicate needs to support the three key items in your strategy. Every. Single. Thing. And that’s where your editorial plan comes in. Your editorial plan is tactical and detailed. It explains what you are going to do and who will do it. If you have your big ideas nailed down and are struggling with execution, chances are you need to spend some time with your editorial plan. As you can see, all of these details are tactical and important. A high-level strategy is necessary, but without an editorial plan to support it, your content marketing program will have a tough time gaining traction. Remember, you need an architect to draw your vision of a new home (the strategy), but you also need the civil engineer to create the construction plan to practically implement the vision. Do you have both strategy and a plan? Does that create a comfortable home for your content marketing? Or do you have a plan, but without a strategy – your content marketing program lives day to day but it doesn’t live up to your vision? 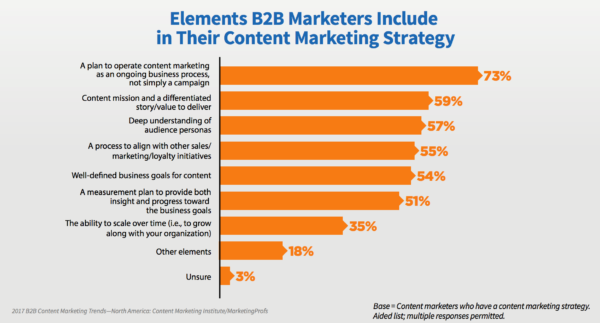 Where are you feeling discomfort in your content marketing program? Would it make sense to fine-tune your content marketing strategy or your editorial plan – or both?